Happy New Year, or Umwaka mushya as we say here. 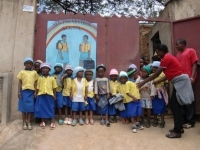 We have started our new school year with 140 children in our nursery. There are now two new Nursery 1 classes and one each of Nursery 2 and 3. 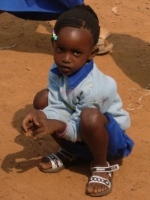 The new children are gradually setting in to an unfamiliar routine, but are already making progress. One of the first things they learn is to say ‘good morning’ and then answer ‘I am fine’ to ‘how are you?’ This is a bit confusing for some who say ‘I am fine’ when we say good morning, but we soon get it right! Lots of new faces and new names to learn, but there are very familiar smiles and hugs each day. There are one or two changes of staff, we have a new night guard called Silas and André will soon be leaving us to spend more time studying as he has so much more work in his second year at University. 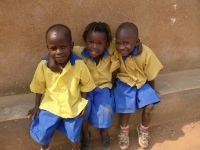 Toussaint has left to go back to school – a huge thank you to their sponsors for giving them a wonderful chance which I am sure they could not possibly have imagined. 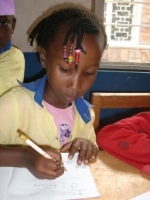 During the break, Chris, Epiphanie and André worked very hard to make arrangements and payments for fees, uniforms and materials for the 68 children we are now sponsoring at local primary schools. 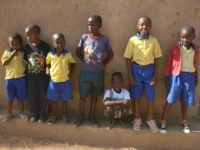 It was very strange without them at first but we have now begun after or before-school classes for them and it is good to have them back with us. 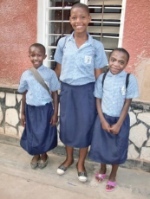 They attend two different schools nearby – here are some of them in their new uniforms. Some of you will recognise these children. They have to have their hair very short so it has been difficult to immediately recognise some of them. The third picture shows some of them proudly showing off their new shoes, sent from the UK in the container organised by Jules and which arrived in early January. very generously. Another container is on its way this year too, it is hard to believe our luck and we are so very grateful. Here are some of the staff and the women of the co-operative in their donated outfits, thank you so much! And below, a selection of other gifts. We are also very impatient to organise the area where we will put perhaps our most exciting gift – a wonderful adventure castle, with swing, slide, cargo rope etc – I just cannot wait to see the children’s faces when they see it. But we need to make an area which is safe, with a sand base to soften any falls and it will take a week or so before we can get it finished. I hope to be able to report on that very soon. It will be a wonderful thing for us. Many of you will remember that Tamar, our Nursery 1 teacher, had a baby girl last year. 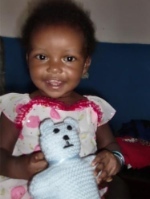 This is Queen, almost one year old now, with her lovely hand-knitted toy which also came in the container. She is happy and so are we! Wherever you are, I hope life is kind to you. I know that many of you across the world have had to endure adverse weather conditions, our thoughts are with Michelle who has returned to Australia and huge challenges. A huge thank you to her and to Vincent who gave their time to the Primary children for their holiday school which I know the children loved. Once again I wish the very best of luck to the students of Leeds University at their Rag Event in April next year. One of their planned activities is to get as far away from Leeds at no cost – having a great deal of fun and raising money for us at the same time – you can find out more by following the links below. Good luck guys, we need all the help we can get!!! Several of the students involved have dedicated fundraising pages on our justgiving site. Also, good luck to my soulmate from schooldays, Lynn Thornley who is raising funds for us by doing a sponsored swim on a certain special bi rthdayand who also has a page on justgiving for donations. She is also arranging other fundraising events in the near future. I feel very blessed to be supported by so many people all over the world. On behalf of the people in the Kinamba project I thank you all, too numerous to mention individually. Your continued support means so very much to us. 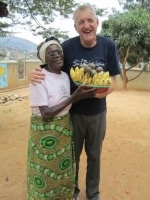 Chris just loves Rwandan bananas!